Booklet 6 of 6 in the Loving God series. Martha illustrates the soul sickness that results when we reject God in the circumstances of our suffering. She also gives the keys to complete and radical healing for our broken souls. Our response to life when things happen to us, whether suffering at the hands of man or Satan, is to believe that God is not really God and that He isn’t good. And we will never love or trust a God that we believe isn’t good—or bigger than man and Satan. The root to so much spiritual and mental illness is a wrong response and a wrong belief about God, and more, God’s sovereignty. “You are going to have to accept what your testimony IS – and none of you will like it. You will wish you had a different one, at least in some aspect. “I am very content with my story…now. I have received it and accepted it because I have received God as the Author of it. In fact, I love my story now because the ‘call to His purpose’ is unfolding and I am amazed that all I suffered formed me into the person who could empathize and then help others know God. How exciting, how significant that is! In God’s Sovereignty, Martha illustrates the soul sickness that results when we reject God in the circumstances of our suffering. Through a deeply personal testimony, she also gives the keys to complete and radical healing for our broken souls. 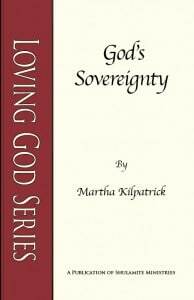 God’s Sovereignty is now available in both print and digital format. The deepest human question is this: Is there a God and is He involved in this world? In my world? Is anybody in control of the universe or is everything happening by chance… Does chaos rule? And that question means, does He have power? Is He involved? Satan has a plan to extinguish your faith in God and your love for Him. He succeeded with Eve and he tries it with every one of us. His objective is to extinguish your love by telling you two lies. All of us deal with these two lies in our lives: God has no power (and) God is not good or He wouldn’t allow evil in the world. My mother died when I was 14. Her death was difficult enough, because she was a tremendous source of love for me. But the circumstances after her death were painful and unhappy for several years until I went to college and then married my hero. As I went on in life, everybody would have said that I had done well, that I had coped with her death. I had taken over a household at 14, gone to college, married and had children. And if you had known me, you would have said I had recovered quite well and was successful at living life. Not long ago, my sister gave me a book about daughters and mothers. One of the statements said that the greatest psychological problems for a girl occur when she loses her mother in adolescent years. I knew so personally how true that was. So I went on living and enjoyed a typical, normal life—very happy. Then I met the Lord in a radical surrender. I had walked very closely with Him about three years when I encountered some pressures in my life and as a result, depression set in. My problems were not that severe, but they seemed difficult to me. I was growing more and more depressed. I kept thinking, “Tomorrow I will be better”—but I wasn’t. A friend of mine arranged for me to visit a little Episcopal convent to spend the weekend in prayer with the Lord. By that point I was so depressed that I could eat very little and I would start crying for no reason. I was in deep despair. While I was at the convent, I went for counsel to one of the priests… a very gentle, blind old man. Later I was walking in the woods and trying to face why I was in such despair. I was crying out to God to help me. I went back to my plain little cell of a room and was very angry with the Lord. I said, “Lord, I gave You my life and You have made a mess of it. I was really better off before I met You. I didn’t have any problems before I started walking with You.” I didn’t know then that I was encountering ‘the cross’ which was meant to kill my problem and resurrect my life. I had no such knowledge of the cross in those early days. Then I remembered something the Lord had been teaching me. Now I was sensing from Him that it was time to put it into practice: “In all things give thanks, for this is the will of God in Christ Jesus concerning you” (1 Thes. 5:18). Emotionally, I didn’t feel thankful, but volitionally I meant it. That is, with my will I chose surrender to Him just as I was and I thanked Him. And afterward I had the attitude: “Well, I have done my part, now YOU do Yours.” My relationship with the Lord had always been on that level of absolute, raw honesty. So I crawled back in my bunk bed and just lay there. A great peace descended on me. In deep quiet I began to think about my mother’s death and the difficulties afterward. Scenes of my grief began to come back to me. Vivid memories (not thought of for years) came back. But this time I was an observer outside looking in on that young girl. And for the first time I knew hers was a tragic story, one that would make me weep in compassion. I had thought ‘me’ stupid and weak, but ‘she’ was truly suffering a multiple tragedy, and doing so terribly alone. I know now that the Holy Spirit became my Counselor in that hour. Isaiah tells us He is ‘Wonderful Counselor’ (Isa. 9:6). We think that He gives us problems for us to solve. So we work hard to solve them and we don’t find the answers. Solutions evade us. But no, He gives us problems to drive us to Him so that He might solve them and show us who He is. It was my Counselor, the Holy Spirit, who was taking me back into my pain and loss and I found myself seeing it all differently. I could see that girl weeping like a wounded animal in a cold house, now empty and without “Baba’s” nurture and provision. But this time I saw that Jesus was there. I had not been alone! My old childhood bedroom filled with His presence and comfort. Time was not a factor. I was there again, but grief was gone because the Lord was with me, I just hadn’t seen Him. Other scenes came, one after another and each time I would see His view and be transformed in my thinking to see the truth and to see my God there in it all. Though I had cried out to Him then, I never ‘felt’ He was there. But now His presence was filling those rooms in my soul, those places that still lived in underground anguish. He began to unravel my wrong ideas and painful views. He gave me the truth about that journey through grief. I was a very sheltered, naïve child—not an adult! And in a totally irrational way I had believed I caused Baba’s death by a few teenage feelings of hatred for her. I could see how normal it was for a child to blame herself for a parent’s death. On the other hand, I was guilty of months of denial that she was dying and withdrawing from her because I couldn’t bear to see her perishing before my eyes. “If I refuse to believe it, it won’t happen.” The Lord washed away false guilt and real guilt, separated them out and was solving the journey in the space of an afternoon. Then it seemed He moved to show me my concept of Him. Deep inside, in a buried place of my soul, there was a long and weary conflict—unsolvable and debilitating to my whole life in an underlying way. I had long since ceased to wrestle consciously with the dilemma, as there was never a resolution. I had just filed it away but the file did not close; it was very much open! Open in the torn depths of my heart. In my deep unconscious, there was a question. My God knew the question though it had never surfaced, was never spoken. What happened that caused her death? Who did it? Did Satan take her… did cancer kill her… did she cause her own death? The worst question was: Did God take her? Somebody was responsible! And even though I loved my Lord deeply and was in a very intense relationship with Him, He was showing me this enormous barrier—not only to Him but also to my own self. In His love, the Lord well knew my heartbroken conflict and He set out as a Shepherd with His crook to bring this lamb home. I said: “Oh, God, I didn’t know that I hadn’t accepted her death.” Then He showed me I had this struggle—who to blame for her death. And He reminded me of a verse I knew from Revelation, “I hold the keys to hell and to death” (1:18). This is a precious story that illustrates the principle. When I was a little girl, my father was an alcoholic. We often didn’t have food because he would take our food money and spend it on liquor. I never had new clothes. I always had to wear hand-me-downs and kids laughed at me. I never had fashionable things and nothing fit me. Everything was used. I had no friends because I never knew what my father would do. I never could bring a friend home because I was so embarrassed, so I was very lonely as a child. She wrote me later that she had been transformed. She was closer to God and free! David was a man who suffered greatly, enough to sink the best of us. As a boy he was not even considered when Samuel asked to see Jesse’s sons. His brothers mocked and accused him of evil motives when he took on Goliath. In Psalm 27, he indicated that his father and mother had ‘forsaken him.’ Saul’s jealous hatred for David was murderous. David dodged a spear many times. Finally he had to leave his home and family and live as a fugitive, completely alone in a barren wilderness. We know the end of his triumphant story, but the man’s journey was filled with injustice, isolation, loss, slander, and terrible fear for his life. He was a candidate to doubt and even hate God, but he was ever grappling with his feelings and his suffering. He did so face to face with God. He came to a deep surrender to his story as recorded in his own words, time and again, in the Psalms. Keep and protect me, O God, for in You I have found refuge, and in You do I put my trust and hide myself. I say to the Lord, ‘You are my Lord; I have no good beside or beyond You’ (v. 1-2). David met the Lord in his isolation, rejection, and suffering. And he had found Him to be the place of safety—a sovereign Protector, powerful enough to hide the man from his murderer. Beyond safety, David found Him to be so good that the Lord was beyond any other good in life. David had no good except the Lord, and He became the man’s only GOOD. Sovereign and Good. The Lord is my chosen and assigned portion, my cup; You hold and maintain my lot (v. 5). The meaning of David’s life became the Lord; he chose Him “as his portion,” meaning that he needed nothing nor wanted anything but the Lord as his possession (portion) and sustenance (cup) in life. In such a precarious life, David found that God could support him and keep his life safe. You will be able to reconcile your story when you know your God. By living daily before Him as David did, seeking Him in need and communion, serving Him in obedience and surrender, you will find Him to be Everything Perfect. All powerful and all righteous. Sovereign and Good. The lines have fallen for me in pleasant places; yes, I have a good heritage (v. 6). David came to embrace and delight in his confinements, calling them pleasant. And in God they ARE pleasant. Without Him they are intolerable. I have set the Lord continually before me; because He is at my right hand I shall not be moved. Therefore my heart is glad and my glory [my inner self] rejoices; my body too shall rest and confidently dwell in safety (v. 7-9 AMP). Here is the glorious result of coming to receive your story by knowing the One Who is God and controls all, the One who is all good…to you! And all that comes into your life, no matter how difficult, you will find to be good, good for your sake. David looked ahead and spoke of the resurrection of the Christ, that He was neither abandoned to Hades, nor did his flesh suffer decay. It was Christ David came to know centuries before He came to earth. It was Christ’s sufferings David experienced prophetically in Psalm 22. Whatever comes into your life, if you will praise quickly, immediately, it is saying, “I believe that God is good and God is sovereign.” Great blessing, great blessing, will come… And that child has been a great blessing! Learn to praise quickly and to know that your God is good. Satan attacks His character and His power. Nothing gets to you that doesn’t pass through God’s hands. Forgiving Him for letting pain come to you. Surrendering to HIS story that He is writing on your life. Repenting of your wrong attitudes and wrong beliefs, about who He is and what He has done. Most people won’t believe it. Most people won’t work it. Most people won’t surrender. I want to tell you that is true: most people won’t. The question is: Will you? Will you be one of the few or one of the many?